Pisces is, perhaps, the most mystical symbol of the zodiac. It completes the zodiac cycle, so its representatives can display all positive and negative qualities of the preceding signs. But Pisces has its own characteristics, which are not inherent in any other symbol. In mystery and mystery they are inferior even to Cancer. Children born under this constellation are often endowed with the gift of prophecy. They have excellent intuition, a clean and vulnerable soul. Pisces child has a rich imagination and early sets parents complex, sometimes strange questions. He worries about who he was in a previous life, where he finds himself, when this one ends. Such children early begin to dream of prophetic dreams. Do not be afraid of the unusual abilities of the child, because in the future his intuition will help to make the right decisions and avoid the danger. Pisces instantly absorb the mood of others, so it is important that they communicate only with kind and calm people. The girl of this sign can be a model of childlike innocence and purity. Now she is smiling sweetly, and it seems that from her smile the world becomes lighter. But after five minutes on the little face floated sadness, the child will close and get to it will be extremely difficult. Pisces has a very unstable mood, it changes for no reason. Her heightened emotionality does not change with the years. The girl is just learning to control it. Pisces-girls adore mysterious stories, are fond of paranormal phenomena. Children are not allowed to engage in mysticism, so watch your daughter’s hobbies. Such things can damage the fragile unformed psyche of the child. Find her more secure hobbies, switch attention to earthly interests. If the little one hesitates to get acquainted with the children, find friends for her. Pisces needs constant communication, loneliness does not do them good. The boys of this sign are endowed with female character traits. They are soft, sensitive, sentimental. But sometimes Pisces can manifest selfishness and even cruelty. This is very dangerous, because Pisces is an already closed and complex sign. Get a son of a pet, teach him to spare animals, take care of the weak and disadvantaged. Parallel to this, develop in him a firmness about determination. Despite the fact that Pisces is a feminine and weak symbol, the boy can be raised strong-willed and responsible, if we seriously do this. The Pisces boy is full of contradictions. The heart says one thing, but the mind is different. Help him figure out himself, find out what will be useful for him at the moment, and what can be refused. Such a boy is easy to offend, he is very worried if one of his relatives fell ill. The quarrels and conflicts in the family are also a great stress for him. Family disharmony is extremely dangerous for Pisces. It is extremely difficult for them to cope with their own experiences. Always support the son with wise and warm words, because the boys of this sign become independent a little later than other children. People of this sign swim with the flow. They are sitting on the shore and waiting for the tide. If he brings them to success and wealth, they will not resist. But it happens that the wave takes Pisces to poverty and decline, and in this case they also do not interfere with destiny. Therefore, the Pisces-child must be sent, to teach to achieve the goal no matter what. Another minus of this sign is suspiciousness. Such children experience through trifles, cry because of the slightest insult. Pisces is a symbol of eternity. For a typical representative of this sign, money is unimportant, it is guided by higher aspects, looks at the world with spiritual sight. It may seem that the Pisces children are not at all interested in how they will fit in life. However, they have goals, but they are not connected with the material side of life. Pisces are good comrades. They always come to the rescue, listen to the person and comfort him. Their generosity and mercy is evident from the first years of life. Pisces need to understand close people, although they do not hurry to open it. Many teenagers of this sign can not decide on the profession and understand what they want from life. If you do not help Pisces choose their path, they can become sociopaths and even criminals. In general, they have the property to regenerate spiritually, but if at the right moment there is no support from relatives, the transformation may not happen for the better. Weaknesses of Pisces is the abdominal cavity, endocrine and nervous system, heart and skin. By nature, they have rather poor health. While the Pisces is in its fantasy world and dreams, it feels good and does not suffer from anything. But as soon as she has to face the realities of a cruel world, hidden health problems immediately make themselves felt. Children of this sign can not be overworked, nervous and worried. They are prone to neuroses and more serious mental disorders. 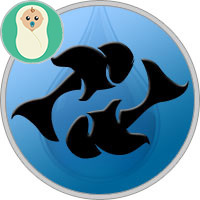 Pisces-children’s body quickly becomes clogged, so you need to periodically clean it of toxins and toxins. Because of obsessive conditions, insomnia and chronic stress, psoriasis can develop. Many Pisces have problems with their feet — deformation of the feet, cracks on the heels, nail fungus. The treatment of diseases makes it difficult to intolerance of medicines, therefore it is difficult to cure the Pisces. You can not let her illness go into a chronic form. The children of this constellation are endowed with many-sided talents. Many of them succeed in theatrical art. If to help the child to open the potential, he will get rid of complexes and will shine on a scene. Ideal for Pisces music lessons. Give the child to different creative circles, he just needs spiritual self-realization. Pisces-boys often take a great interest in physics and technology, from them beautiful scientists-theoreticians can leave. Children of this sign often show a passivity and do not want to attend any classes outside the school. In this case, it is necessary to interest them and push them to action. Rarely, what kind of Pisces is independently chosen for people. To realize her talent, you need a competent mentor, a strong patron. Therefore, encourage your child independence and commitment to early childhood. In general, the children of this sign study, like all ordinary schoolchildren. They are attracted to all the unidentified and mysterious, so they prefer the history, mythology, astronomy. Pisces does not strive to be an excellent student, to win medals and certificates. Her vanity is not inherent. It absorbs knowledge in order to be spiritually satisfied, not glorified. It is unlikely that she will be able to become an activist and soul of the company. In the class she is a loner. Many Pisces remain mediocre schoolchildren, do not stand out. They grow typical gray mice. To awaken the individuality and develop talents in the child, one should notice the slightest of his successes, to feel the subtle vibrations emanating from his soul. Only real and experienced teachers can do this. The sad thing is that many teachers ignore the amazing abilities of Pisces and do not recognize their hidden potentialities. Small Pisces can be whimsical and troubled children. They continually fall into melancholy, their mood is changing rapidly. Teach Pisces not to suppress emotions, but to control them. Let the child do not fixate on his fears and far-fetched problems. Teach him to enjoy life, communicate and get to know his peers. Read to him only kind fairy tales, avoid cartoons and films that bear cruelty, have horror scenes. In adolescence, Pisces can get involved in questionable spiritual practices, join asocial youth groups. A very high risk of teenage suicide. Watch for the pastime of the child, do not allow to be influenced by intruders in social networks. Girls often join groups where anorexia is advocated. Protect the child from the influence of false values. Develop in Pisces strong-willed qualities. They must be able to stand up for themselves and learn how to say no. If parents fail to become a friend and support, they will find dubious friends who can break his life and involve other dangerous phenomena in drug addiction. Parents need to identify the hidden problems of the child and solve them together.